With the weather heating up, it will not be long before your air conditioning becomes a necessity. But before the really hot days get here, you should check to see how your AC is running. Just putting it on for a little while may help you determine if it is working properly. Of course, it is best to have a maintenance plan so that a professional will check it every spring. Preventing problems is always less costly than paying for repairs! If you discover your air conditioner not cooling clearly there is some sort of issue. Also called Freon, this is the fluid in your system that cools the air. Refrigerant should not require a refill, so if levels are low, there is probably a leak. 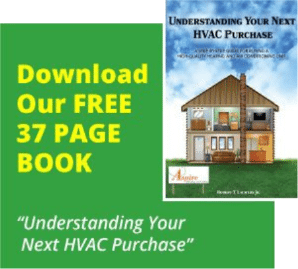 An AC unit relies on a fan to run properly. Therefore, if the fan is not working as it should, your system will never be able to effectively cool your home. If you have not changed your air filter in a while, you probably need a new one. Because they accumulate so much dirt and grime, air filters need replacing frequently. A dirty one blocks the return airflow, which hurts the AC’s ability to circulate the cooled air. Sometimes the problem is so obvious you can’t see it. If all else fails, check your thermostat to make sure you actually have the AC on. It is possible you have the fan setting on. This may supply some cool air, but not to the level of the air conditioning. If your AC still isn’t working after you’ve checked those areas, it is time to call in the pros. The experts at Aspire will figure out why your air conditioner not cooling is an issue and what to do about it. We offer all AC services, including regular maintenance and repairs. Our after-hours service for existing and maintenance-plan customers is a major benefit.